BlogArizona.com - An Arizona Real Estate Blog: AZ Real Estate Blog has its Perks! AZ Real Estate Blog has its Perks! Okay, I'll tell you up front that this post has absolutely nothing to do with Arizona or real estate. And in the spirit of full disclosure, I was asked to write this post but it's all my opinion and I was not paid. Well...I did get the free use of a $40,000+ vehicle for a week! Dodge and Matchstick are doing a 'word of mouth' marketing campaign for the 2008 Dodge Grand Caravan. They selected fifty "influential moms" in the Phoenix area to test drive a fully loaded 2008 Dodge Grand Caravan for a week (and I mean FULLY loaded!). I'm not sure how I qualified as an "influential mom" when my own kids won't even listen to me. But for a free tank of gas and the opportunity to put a week's worth of mileage on someone else's vehicle, I'll let Dodge think whatever they want! So they brought me a brand new, fully loaded 2008 Dodge Grand Caravan all gassed up and ready to go. It had just under 500 miles on it when delivered (luckily it was past the break-in period so I could really test drive it!). I got to keep it for a week, and they encouraged me to drive it as much as possible. They even said I could let other people take it for a day or so (as long as they were 21 years old with a valid AZ driver's license). It was fully insured by Dodge's insurance, not mine. They showed me how to use all the features and gave me a list of phone numbers to call in case I had any questions or problems (of course it came complete with roadside assistance). They even left me a camera to take pictures of my adventures, and a list of games for kids to play in the car! All they asked is that I write a blog post about my experience afterwards. As a business owner myself, I have to give Dodge a great deal of credit. Asking me to write about my experience before they knew whether it was a good or bad experience was pretty gutsy. They're obviously very confident they have a great product. And why wouldn't they be confident. This van has everything you can think of. It has all the usual goodies - AM/FM stereo with CD, cruise control, tilt wheel, 3-zone AC/heater, alarm with door remote. And of course it has power everything - you can even open the back (hatchback) door and two side sliding doors with the alarm remote, or by using buttons located inside the van. You can also use the remote to start the van from a distance, to get it warmed up or cooled off ahead of time. From the driver's seat, I have complete control over every door, every window and basically every feature in the van. It has an awesome sound system, satellite radio, satellite TV, GPS navigation with voice recognition, two DVD/CD players and two TVs (both with video game hookups and wireless headsets), rear back-up video camera, a touch screen console, and my teenager's favorite feature - it's IPOD compatible! (complete with USB port for downloading music and pictures to the vehicle's 20GB hard drive). There are music controls on the side of the steering wheel, which makes it easy to change the song or turn up the volume without taking your eyes off the road. The power seats adjust in every way possible. It has sliding doors on both sides, which is much more convenient than the traditional vans that just have a sliding door on one side. It even has good drink holders! One feature that I hadn't seen before which is pretty cool is the power adjustable foot pedals. That's right, not only can you adjust the seat, but if you have longer or shorter legs than usual, you can move the foot pedals back or forward to allow total comfort while driving. And speaking of driving, this van drives great. Of course, most new vehicles drive great. But this van doesn't feel like a van at all. It handles like a much sportier vehicle. It corners well and has more than adequate get-up-n-go. In fact, my husband and I bet on the engine size. I said it must have a V8 as quick as it is, but he said it probably has a V6. I lost that bet - it's a very fast V6. I can't really comment on the gas mileage since I drove it like I stole it (just kidding Dodge!). Actually, I don't know how big the gas tank is, but the computer readout on the dashboard said I was averaging 14.2 miles per gallon. This van also has a very nice turning radius. It's very easy to park even in somewhat tight spaces, and it can make a U-turn just about anywhere. I really enjoyed driving it. But anybody who wants to impress me with a car definitely has their work cut out for them. Since I spend quite a bit of time in my car, I'm accustomed to driving some pretty decent vehicles. To be fair to Dodge, I should give a little background information about the vehicles to which I was comparing this van. I currently drive a newer model Lexus SUV, and sometimes I drive my company's Hummer for business purposes. My last car was a new BMW 528i. Before that I had a lightly used BMW 525i. Before that, I had a lightly used Nissan Maxima. Not only do I generally buy foreign cars, but I've also never really considered myself a minivan type person (although I would consider a van, and I did drive a Toyota minivan several years ago). My husband, on the other hand, has always driven a truck and Dodge is his favorite. We've owned several Chevrolets and Dodges, and the Dodge trucks we've owned have always been more comfortable and more reliable than Chevrolet trucks. But the new Dodge Grand Caravan takes comfort to a totally different level. 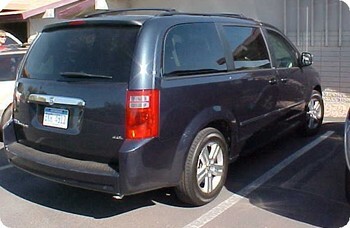 In fact, if I had to summarize the Dodge Grand Caravan in 2 words, they would be: comfortable and functional. It's not just the features that make this van great, but the way in which they're organized. It has two captain's chairs in the middle row, and a 3-seat bench in the back (all leather and power, of course). The middle and back row seats can be re-arranged in every which way possible. You can turn them towards each other and put a table (included) in between (so it's kind of like sitting in a booth in back). You can fold & stow away the third row of seats, or I think you can even take them out altogether to haul stuff (but I didn't try). You can even reverse the third row seat so that it faces backward for tail-gating. There are lights and AC vents for each passenger, so everybody can get comfortable. There are even several regular 110V outlets like in your house. So the teenage daughter can finish curling her hair on the way if you're running late! Each window has a sunscreen that you can pull up to block the sun (very necessary in Arizona - my kids loved that feature). When not in use, they retract back into the door where they aren't really visible. This vehicle is extremely well organized, and again, very comfortable for the whole family. I took some pictures of the van's interior, but they didn't turn out nearly as well as the pictures on Dodge's website, so I'm not posting them! Dodge targeted moms with this campaign, but I would also suggest another target audience - real estate agents. This van is perfect for driving clients around town. You can fit seven people very comfortably, you have GPS navigation to find your way around, and the two TVs can have two different movies or video games playing at once to keep the kids happy. With all the technology and features, this van could easily be an office on wheels. And even the pickiest client would be happy to go house hunting in this van. In short, Dodge's 2008 Grand Caravan is the perfect real estate agent vehicle! The only complaint I can think of with this van is that there are too many features and buttons (not really a complaint, more of an observation!). Most of the features were very user friendly and easy to use, but there were a few things I couldn't figure out. I'm sure it was user error and in time, I would learn to use them (so Dodge, how about one more week with the van? Or heck, how about a free year with it - I'll even write another post!). Both of my kids loved it and didn't want to give it back. My (almost 16-year old) daughter even asked if I would buy her a van like it. Surprised at my somewhat spoiled teenager, I responded, "You'd want to drive a mom-mobile? Your friends would make fun of you if you drove a minivan." And she said, "Yeah they would, until they saw the inside. Then they'd say, let's take Sara's van!" That sounds fun. how do I sign up for a week with the van! your right every realtor needs a comfortable car. but it takes more than a good car. the realtor has to be knowledgable and provide good service. a home buyer has to be comfortable in every way to sign a contract obligating them to 30 years of payments. "They even said I could let other people take it for a day or so"
Darn cell phones never work when you need 'em! Okay, maybe I forgot to call you, but Dodge was targeting "moms" with this marketing campaign (I know, I should have called Francy then - sorry!). Maybe after reading my post, they'll do another similar campaign targeted at REALTORS (everybody else targets us, right!). Note to Dodge: Jay Thompson (aka Phoenix Real Estate Guy) is the first AZ Realtor you should call for that campaign! Thanks for stopping by Jay. I have to admit I haven't spent much time in the blogosphere lately, so it's definitely good to hear from you. Take care.